Alcohol Training is becoming more and more prevalent across the hospitality industry. Both Illinois and Indiana have mandated liquor training for bartenders and servers in their respective states. Even in states without mandatory server training requirements, more and more municipalities and counties are adopting mandatory training policies. Insurance companies may grant disounts for having employees trained, and some require it as a condition of writing coverage. Aside from who is making licensees do it, training your employees, especially your servers, is just good common sense. These are your front-line people, the ones interacting with your customers. In a day and age where a business can be held liable for the actions of a patron they served alcohol up to 24 hours ago, as is the case in Illinois, training a young bartender or waitress could be the difference between claims and lawsuits against your livlihood for hundreds of thousands of dollars. We have developed an alcohol seller/server training program which is fully-licensed and BASSET-approved by the State of Illinois. It is called RAMP - an acronym for Responsible Alcohol Management Practices. The program takes around three hours to cover, including pre and post testing. Those who successfully complete the seminar can fill out a form which we will submit to the State Liquor Control Commission, who will then issue you a certified server card. Groups: Most of our training sessions are done in large groups. We typically have a date in Madison and St. Clair Counties every 3-4 months. There is usually an afternoon and an early evening class on each date so that as many workers as possible are able to attend. Training in other areas is not on a regular schedule at this time. If there is nothing listed on the schedule below then we do not know when the next course will be. We do keep a "wait list" to notify foks the next time we do get something scheduled in your area. For any questions you may have or to be added to the wait list, please contact Bill at 888-249-0035 or by email at billv(at)bretdixonins.com. You may also want to bookmark this page, and/or follow Bret Dixon Insurance on Facebook or Twitter, as we pass along announcements thru there. Individuals: The online version of our program is not available at this time. If it becomes available online again, you will find it here on this page. We may be able to recommned some other online services if time is of the essence. Contact us at the email address above. Check this map for the deadline by which employees in your county must be BASSET trained. As of July 1st, 2018, mandatory BASSET training is now in effect for ALL counties in Illinois. Illinois mandates we make available a list of individuals who have successfully completed liquor training through our program and the date of completion. BASSET training is good from 3 years from the date of completion. The attached database contains individuals who have passed one of our courses since January 1st, 2013. The file will open as a spreadsheet. For faster searching use the Ctrl + F search feature or sort/filter by name. 5500 North Belt West, Belleville, IL 62226 Register to: 618-234-6500 or barry_gregory(at)yahoo.com. We are also working to firm up dates for training in other areas over the next few months. Check back for more info or join our waiting list here. Contact us at 1-888-249-0035 or via email at billv@bretdixonins.com to register to attend one of our courses. Pre-registration is required, as some venues may have limited space. If you need trained prior to our next upcoming class, the ILCC maintains a list of approved BASSET course providers as well as upcoming courses here. After successful completion of a course we will issue you our certificate of completion. We will also submit your information, provided you completed all necessary info in a legible manner, to the State Liquor Control Commission for issuance of your Illinois BASSET card. It may take a few weeks for them to issue you your card. When they do, it will look like this. 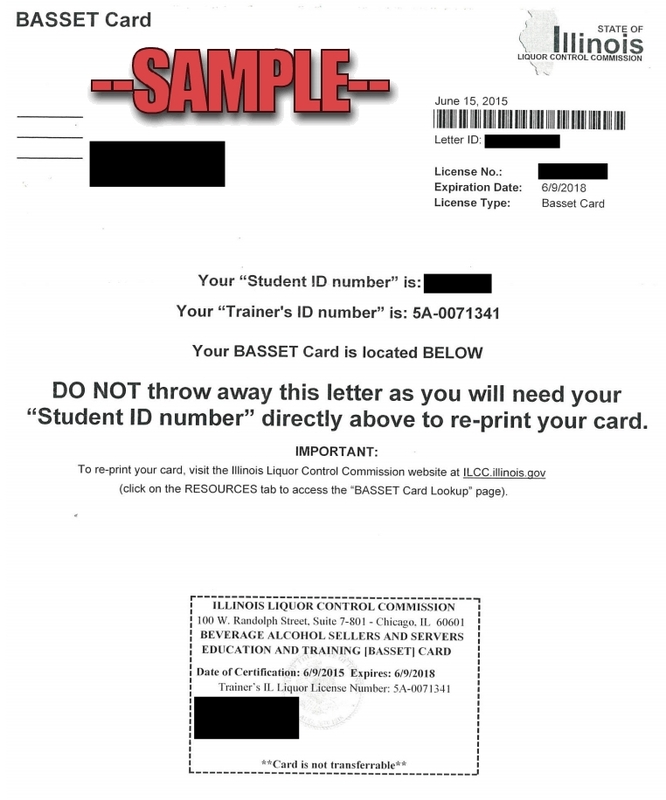 If you have lost your state BASSET card, you may follow this link for info on requesting a new one from the ILCC. You may also contact them at 217-782-2136 (Sprinfield office) or 312-814-2206 (Chicago office) or email them at ILCC@illinois.gov.